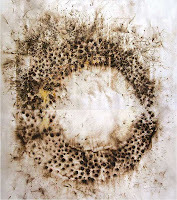 Cai Guo- Qiang draws using an unconventional media- gunpowder. This gives rise to issues of control. The artist has an idea of the overall image he wants to create but what degree of control does he actually possess? He says he wants the process to give him problems to overcome and for it to take him where it wants to go. Guo- Qiang's work deals with cultural issues and takes a lot from Chinese philosophy but on a purely aesthetic level the large-scale images recall both the abstraction of Western Modernism and the lyrical forms of Chinese ink painting. I was shocked by the shear scale of these drawings when I came across one for the first time in the flesh last year at the MoMA, I'm interested in the performative aspect of these drawings and Guo- Qiang's sky drawings and the fact that they are spontaneous and cannot be completely controlled by the artist.